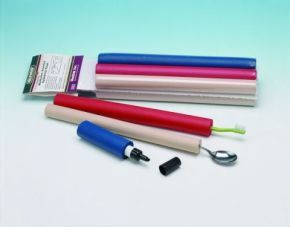 Foam Tubing 'Closed Cell' for added gripping ability. An assortment (two of each) is available for adults and children. The paediatric assortment comes in bright colours, yellow, orange and blue). This is also suitable for the visually impaired. The Adult assortment comes in tan, blue and red. We purchased this to use with clients for cutlery/pens etc , good quality and very lightweight. A good selection of sizes for the price .